Marvel is expanding its Disney Parks presence this year with a number of attractions opening at various international locations. First up is Ant-Man and the Wasp: Nano Battle, which launches on Sunday at Disneyland Hong Kong. Although the ride doesn’t officially open for two more days, the park offered a sneak peak at the attraction earlier this week that kicked off with a ceremony attended by Paul Rudd, Peyton Reed, Kevin Feige, and many more special guests. Since a plane ticket to Hong Kong isn’t exactly within everyone’s reach, some fans might have to settle for a pair of POV videos (via /Film) that have made their way online. You can check them out for yourself below. Ant-Man and the Wasp: Nano Battle takes place at the S.H.I.E.L.D. Science and Technology Pavilion. Upon entering the building, guests will traverse through halls lined with what look like giant smartphones detailing multiple S.H.I.E.L.D. projects. Unfortunately, they won’t have much time to admire the organization’s ingenuity. Arnim Zola has just launched an attack on the facility with an army of Swarmbots. To combat this threat, Scott Lang and Hope van Dyne are recruiting the building’s visitors to help them. Rudd and Evangeline Lily reprise their roles from the Ant-Man films via onscreen appearances. Patrons will eventually board an indoor coaster and arm themselves with blasters, with Scott and Hope directing them to aim for the enemies’ weak spots. The targets are stationary, so it’s not difficult to get a bullseye. At one point, riders are told they’ll be shrunk down to ant-size in order to infiltrate the “hive bot” and defeat Zola once and for all. This part of the ride also features impressive 3D holograms of Scott and Hope, which are sure to make guests feel even more like they’re fighting alongside the MCU’s pint-sized heroes. The ride’s premise ties into Disneyland’s other Marvel-themed attraction, the Iron Man Experience, which opened in 2017. While Scott and Hope defend the pavilion, Tony Stark is dealing with his own infestation of Swarmbots in nearby Kowloon. Iron Man is also seen and heard throughout Nano Battle. However, we’re pretty sure that’s a Robert Downey Jr. soundalike providing his voice. 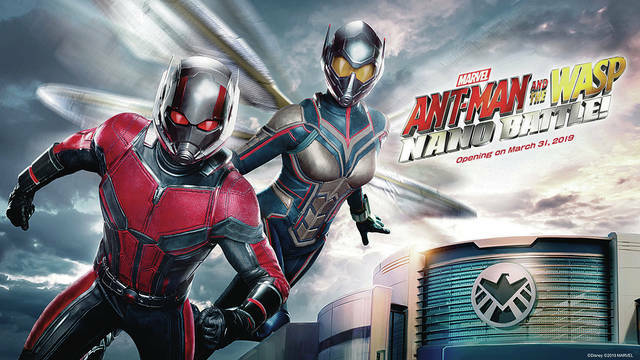 What are your first impressions of Ant-Man and the Wasp: Nano Battle? Tell us what you think in the comment section below!